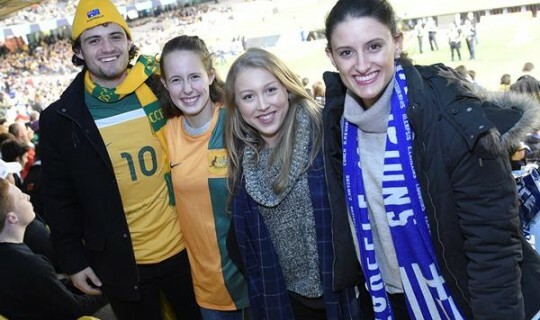 Over 33,500 people attended a fierce encounter between the Greek National Football Team and the Socceroos at Etihad Stadium on Tuesday night. The match result went the way of the Greeks and featured an outrageous goal from over the half way line, however the real success of the event was in the carnival atmosphere that preceded and continued through the event – an event populated by families including thousands of children. “The GCM congratulates the Victorian Government and in particular the Minister for Sport John Eren for making this match happen” said President of the Greek Community of Melbourne (GCM), Bill Papastergiadis. “The event is a great example of this city’s cosmopolitan and multicultural identity. The prematch dance groups and entertainment on the stadium concourse and the carnival atmosphere in the stadium are a great testament to major events held in this city.” Papastergiadis continued. There was of course media reports of a handful of irresponsible patrons lighting flares. The GCM condemns the actions of these so called fans who not only are illegally lighting flares and putting people’s safety at risk but who are also significantly damaging the reputation of the sport. “Last night over 33,000 people attended a great sporting and cultural event. The actions of 2 or 3 irresponsible people should not cloud this fact” said Jorge Menidis, Director of the Greek Centre.